My son Brendan was born in June of 2000 and is the youngest of 3 boys. His medical struggles started when he was just a few days old. He came home with me and ended up back in the ER a few days later with sepsis. After a daunting run of iv meds he came back home. At around 3 months old we noticed his nystagmus very clearly and he started having seizures. Due to the lack of information on PMD he was subjected to quite a few tests...spinal taps, emg, muscle biopsy. After seeing a few pediatric neurologists in our state we decided to bring Brendan to Boston Children's Hospital. after sitting with the neuro there he looked at me and said he thought he knew what Brendan had but it was text book. He had never seen a child with PMD, only seen it in books. He advised me not to read too much about PMD until we got the tests back from his bloodwork. At that time he had a FISH analysis done at Baylor College. When I first got the news I was broken. I did not know where to turn, who to talk to. I was tested and I am a carrier, so is my mom. I found the PMD foundation and reached out to another mom. It was a wave of relief and despair at the same time. The information available in the early 2000's was limited and somewhat damning. At first we were told he had the connatal type. My mom and I went through a period of feeling guilty and terrified. my family went to our first PMD gathering around 2003 in Indy. Met many wonderful families. Got hope. by this time Brendan had already had a lot of time invested with early intervention. I had physical therapists, occupational therapist and others in my home up to 5 days a week. he started preschool at 3. He soon became one of the most popular children in the class. We went to the PMD conference in Indy for a 2nd year. at that point Brendan was part of the ongoing study at Wayne state. Dr Garbern clarified for us that Brendan had the classic form, not the connatal as thought. but he did have seizures. My family went to Make A Wish and they sent us to Disney and Give Kids the World. It was an amazing experience. I was watching Brendan become stronger and more determined by the day. He perfected combat crawling, went to school everyday. I really started to make peace with PMD. 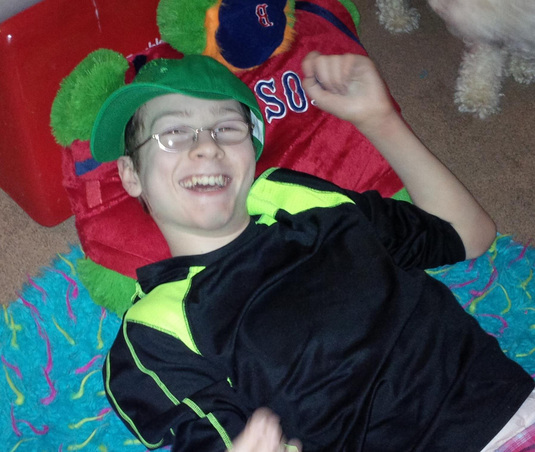 I became determined to get Brendan the best care, fight for him. watching him struggling to do things and keep trying inspired me in ways I can't explain. It didn't matter that our family support lived all over the place. We are family just the same. Over the years we have been to Detroit 2 times, Indy 2 times and Delaware 2 times. Traveling with him has become very difficult though, so we miss the conferences now. Brendan is now getting ready to turn 15. He is in middle school with a teacher that insists on including all of the kids in special education involved as much as possible, wherever possible. Brendan went to his 1st school dance, is involved with integrated basketball and as of this writing, integrated dodge-ball. His confidence has soared. He came home with carnations from girls for Valentines. He has his 2nd power chair that he has done phenomenal with. He is visually impaired but can't tell now thanks to some super cool glasses. Brendan brings out the best in most people he is around. We watch him keep going. If he can't figure something out, he don't give up but gets more determined. The seizures are under control. He got mad at his teacher one day and drove his chair over to the door, opened it and drove off in the hallway. Normally this would earn a kid a first class ticket to the principal, but teacher, 1-1 and other classroom assistants watched it with pride. He is a teenager. I love hearing these stories as much as his teacher loves telling them. The young man is full of pluck. I can't begin to really explain him. I hate when people stare or ask what's "wrong" with him. He is the most amazing person I know. There is nothing "wrong" with him. Over the years I have become a major advocate. But I can't say I did not have my really bad days in the beginning. Several families have been a source of strength. That is a skill I am learning to share with the next generation of PMD kids. I really think love has been the driving force. All the pt, ot etc in the world can't give him the drive he has. He still has considerable health issues, but they come and go. His peers look at him like he is one of them because he is, not because school teaches them that's the right way. He was very picky on food but is getting better. His nutrition still comes from PediaSure. He sees his ortho a few times a year. so far no major surgeries but one is lingering in the future. I'll take it in stride when it comes. I figure if he can take it all in, so can I. I would not change a thing about him. As most PMD parents will agree...he is an angel here to inspire and touch the hearts of those around him.